Sustainia created a shared framework for universities on how to improve environmental sustainability, supporting their efforts by equipping them with valuable best practices. Universities face some specific sustainability challenges, including improving energy efficiency of old buildings and implementing effective waste policies. Solving these operational challenges can have a high cultural impact, as universities are also the training grounds for the world’s future leaders. Universities have the capacity to test systems and technologies, and to advance innovative solutions to global challenges in ways that companies and municipalities cannot, but often don’t know where to start. 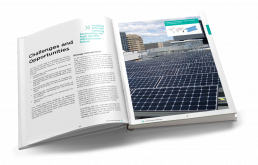 In this publication, Sustainia analysed the challenges and opportunities for universities to develop more sustainable pathways. By presenting cases from IARU’s network and examining the hurdles and solutions, the publications serves as a way through which to share best practice, and inspire universities globally to do more and show how the education sector can help drive change. The report is available for download on IARU’s website. The International Alliance of Research Universities (IARU) is a collaboration between ten of the world's leading research intensive universities who aim to address the grand challenges facing humanity. The Alliance has identified sustainable solutions on climate change as one of its key initiatives.